In 1973, the Chicano Movement in San Diego was at its height, and local artists who were a part of the takeover of land under the Coronado Bay Bridge began painting murals in what came to be called “Chicano Park.” When the movement and the murals in the park began to receive international recognition, a French reporter representing the Alice B. Toklas Collection came to San Diego to interview local artists for a story. She brought with her a copy of the famed 1957 David Douglas Duncan photo “Picasso’s Eyes.” At the time, local artist Salvador “Queso” Roberto Torres handed the photo to Mario saying, “Here, take it. You’ll know what to do with it.” Picasso, who already stood as a much-loved and iconic figure for local Chicano artists, had recently died. Five years later, in 1978, the reporter’s gift would inspire Mario to paint his first of ten “Eyes of Picasso” murals on the four-story Community Arts Center in downtown San Diego. 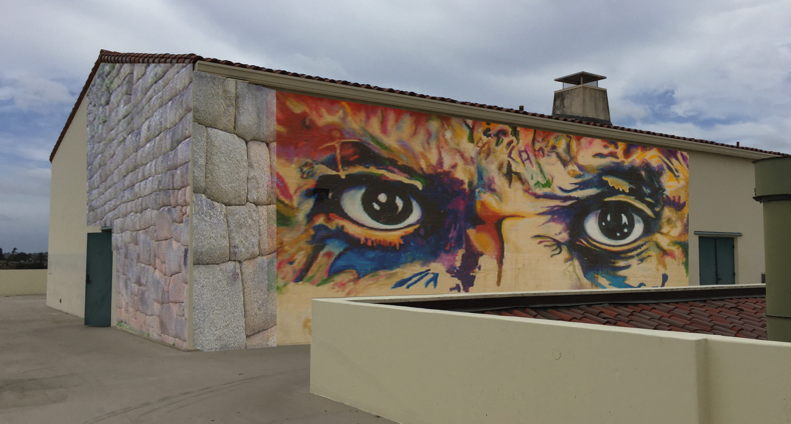 Other “Eyes” murals would eventually crop up in Barcelona, Lima, Toledo, Ohio, and of course, Barrio Logan. * The School of Art + Design we will be having a live aerosol art demonstration on our new mural installation with participation by SDSU Students, artist Mario Torero and muralist Isaias Crow! Learn more about artist Isaias Crow.